A Leap of Faith: Actor. Warrior. Hero. 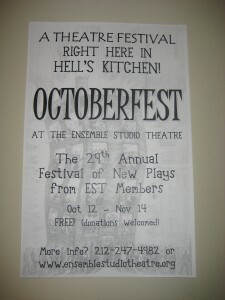 I just completed directing a project in the 29th Annual Octoberfest at the Ensemble Studio Theatre* in New York’s Hell’s Kitchen. I am writing this blogpost because an exceptional actor named Richard Topol has inspired me. Rich, as everyone calls him, is a perfect example that actors are as courageous as any warrior. Truly, they are heroes. 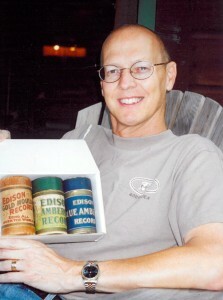 Rich probably has no idea how much his work meant to me in the few days we worked together. I suspect he believes he was just doing what he does as an actor. 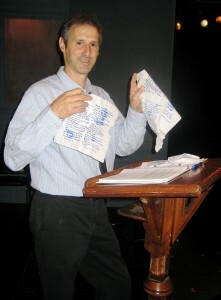 The project was David Perry’s Eulogy, a one-person play in which a man comes to an emotional reckoning with his abusive mother as he eulogizes her. The play could be described as the technical equivalent of singing four arias in forty minutes and performing Hamlet’s soliloquies in between. And this with one rehearsal. I had seen Rich on Broadway in a hilarious and heart wrenching performance in Awake and Sing, but met him for the first time at our one rehearsal prior to the two readings. Within 5 minutes it was clear that he trusts himself to exist fully in the moment; if he gets lost along the way he has the courage to live in the unknown – essentially in free-fall – until he discovers something he can grab on to and move on. This, of course is one of the principles of Theatrical Intelligence: success comes with having the courage to step into the unknown. Actors must find a comfort level with whatever they’re doing, and a staged reading of a demanding script in front of a savvy audience with virtually no rehearsal can be daunting. Many actors just won’t do it. Understandable. It is rather like being asked to jump off a cliff not knowing if your parachute is going to open. Other actors, and Rich is one, are willing to take that leap of faith, and jump. What if we could all live this way every day? “Live here for a while…” not knowing where it might lead. If we can trust that it is OK not to know where we are emotionally or intellectually or spiritually, it leaves open the possibility of discovery. If we are open to discovery, just think what new things we can learn! Thank you, Rich, for your leap of faith. You are a hero. *EST was founded in 1972 to nurture individual theatre artists in the development of new American plays, and has produced 6,000+ new works over the decades. I have been a lucky member of this family of 500 theatre artists since 1977.